Livestock owners know the importance of a decent fence. If you have cows, horses, or other animals on your ranch, it’s vital your fence is able to stand up to years of use and abuse. After all, a poorly constructed or broken fence could cause a massive loss, both in repair costs and veterinary bills for injured animals. That’s why vinyl fencing is the best choice for your ranch or farm. What makes vinyl superior to other types of rail fence? Vinyl is more durable than wood. A vinyl fence doesn’t absorb water, doesn’t bend or warp in the heat or cold, and doesn’t rot like wood does. Wood fences can’t compete with vinyl in terms of durability, and they need much more maintenance over their lifespan, such as regular painting, staining, or sealing to avoid water and sun damage. This makes them much more costly to maintain over a long period of time. 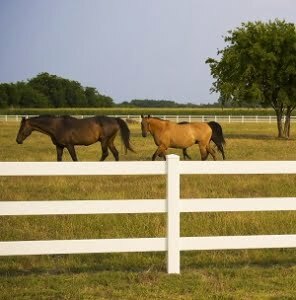 Vinyl is also superior to wire fences, the most common type of ranch fencing. Though wire is cheap, it breaks easily, meaning you have to devote large chunks of time to monitoring and repairing your fence line. Plus, animals can easily become tangled or cut themselves on barbed wire, increasing the chance of injuries. With vinyl rail fencing, you never need to worry about stain, paint, or other treatments, and you encounter a much lower chance of injury to animals. Vinyl fence is ready to install right off the truck, and it stays the same for as long as you use it – no warping, stretching, or other problems. Plus, vinyl fences are much more visible than wire, making it less likely your animals will harm themselves. You avoid losing functionality in your fence due to exposure, and you get a classic, traditional look for your ranch. And with vinyl, you get to enjoy that look for as long as you have the fence. Detractors will tell you that wood or wire fences are easier to fix than vinyl in the event of serious damage, or that vinyl will fade and crack as it ages, or that it’s too expensive to be useful. But with modern vinyl ranch rail fences, these complaints hold no water. Modern vinyl fencing is made with a high quantity of UV inhibitors to protect it from the sun, and the modular fencing panels make fixing damage a breeze. And while vinyl is more expensive, it pays for itself in lower maintenance and less frequent damage. In short, vinyl ranch rail fencing is the best option for a ranch or farm in nearly every case. And if you want the highest quality of vinyl fence for your property, you need to contact Future Outdoors. We’re the number one vinyl fence contractor in the Dallas metro, and we would love to show you how a vinyl fence can give you years of reliability and performance. Contact us today to schedule a free consultation and learn more about our vinyl fencing options, or follow us on Facebook to get special deals and updates!